ISTANBUL, Turkey (July 28) - Nearly four months ago, Jordan BURROUGHS (USA) posted a photo on Instagram with the caption “If you want to be the king, you have to beat the king.” Frank CHAMIZO (ITA) did just that on Saturday, getting his revenge against the London Olympic champion in front of a sold out Bağcılar Olympic Sport Hall in Istanbul, Turkey. Chamizo, the two-time world champion was looking to avenge his loss to Burroughs from May’s Beat the Streets in New York City. In that match, Chamizo commanded the early 4-0 lead but was outscored 6-1 in the final four minutes of the bout, losing the match, 6-5. Saturday’s bout kicked off a little differently than the outdoor “ice skating” match in New York, as Burroughs scored the match's first point, nearly grabbing a takedown from a low single, but settled for a step out point. The American coaching staff thought Burroughs should have been awarded the takedown and threw the challenge cube. The original call on the mat was confirmed, and Chamizo was awarded a point for the lost challenge, giving the Italian the 1-1 lead on criteria. With 45 seconds left in the opening period, Burroughs, the four-time world champion picked up the pace and forced the referees to put Chamizo on the activity clock. The American shot a double, came up to a single and picked up step out point, taking the 2-1 lead into the final three minutes. Chamizo surrendered the bouts first takedown after Burroughs snagged his heavy stepping left foot with a low single, extending his lead to 4-1. Down by three, Chamizo scored a reversal, cutting Burroughs’ lead to 4-2. But, not before the Italian corner threw the challenge cube, questioning if Burroughs secured the takedown before scoring the reversal. Once again, the referees came together and confirmed the call on the mat, awarding Burroughs a point for the lost challenge, giving him the 5-2 lead. After giving up his second step out of the match, Chamizo, who is known for his defense scored his first takedown and cut the Olympic champions lead to 6-4 with one minute remaining in the final period. 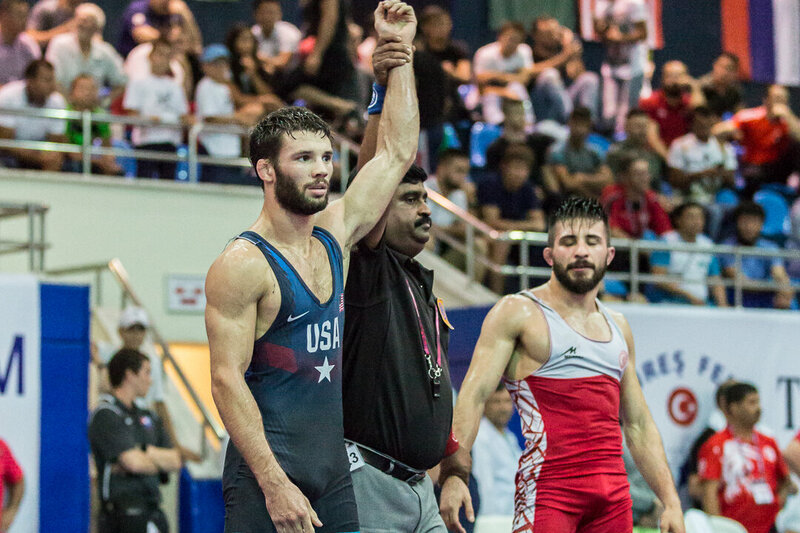 The Cuban turned Italian increased his sense of urgency after Burroughs extended his lead to 8-4 with his second takedown of the bout. Chamzio, with his cat-like reflexes, found himself fighting off a Burroughs double, but turned his defense into offense, exposing the American and picking up four points on the out of bounds line, ultimately taking the 8-8 lead on criteria. The Rio bronze medalist closed out the bout with his third takedown and took the 10-8 lead. Burroughs would score the final two points, but Chamizo held criteria and was victorious, 10-10. With that win, Chamizo evens up the series at one apiece. The next time these two could potentially meet would be in October at the 2018 World Championships in Budapest, Hungary.